Come and take a break! The Alumni Relations Office invites you to take a break with us during Spring Reunion Weekend 2014. Join us for a unique opportunity to mingle and network with our alumni back on campus for reunions. Enjoy a spring inspired fare in the Law School Courtyard Tent. Progressive Formal is Friday, April 25th and tickets are on sale now! Visit https://progressiveformal.splashthat.com/ right away to buy yours before they sell out. IQ2 debate series, Intelligence Squared which can be heard on over 220 NPR stations across the nation. The series is based on the traditional Oxford-style debate format, with one side proposing and the other side opposing a sharply-framed motion. This IQ2 Debate, “Affirmative Action on Campus Does More Harm than Good” is open to the HLS community. Space is limited, HLS ID required. Reserve tickets here. Before the debate begins, the audience registers their pre-debate opinion using an electronic voting system. Alternating between panels, each debater gives a 7-minute opening statement. After this segment concludes, the moderator opens the floor for questions from the audience and inter-panel challenges. The debaters have one final opportunity to sway audience opinion through their 2-minute closing arguments. The audience delivers the final verdict by voting again whether they are for, against, or undecided on the proposition. The two sets of results are compared and the winner is determined by which team has swayed more audience members between the two votes. More information on this special event can be found here. Email dos at law.harvard.edu with any questions or concerns. Drink tickets and appetizers will be provided. Please email dos@law with any questions or concerns. Salant Lecture “On Journalists and National Security” at the Harvard Kennedy School. On Thursday, October 10, Floyd Abrams, partner at Cahill Gordon & Reindel LLP and a prominent First Amendment Lawyer, will deliver the Salant Lecture “On Journalists and National Security” at the Harvard Kennedy School. There will be a limited number of seats for law students at dinner and the lecture. Interested students should email dos@law with their name, class year, and a short statement (a few sentences) of interest in First Amendment Law by Thursday, October 3 at 5pm. Comedian Bill Burr is performing at the Wilbur Theater on Saturday, February 23 @ 7pm. Tickets are on sale at the Dean of Students Office in WCC 3039 for a discounted price of $20 each, limit two tickets per purchase. Payable by cash, check, or credit card. First come, first serve. Merrimack Premium Outlet – Shopping Trip! You are invited to join your fellow HLS students for our upcoming shopping trip to the Merrimack Premium Outlets – stock up on winter weather wear apparel and take advantage of this opportunity for early holiday shopping! Round-trip transportation and VIP coupon books will be provided. Please complete the following poll asap to reserve your spot: http://tinyurl.com/Outlets2012 Space is limited, and participation will be determined on a first-come, first-served basis. We will follow up early next week to confirm attendance and provide more information in preparation for next Friday’s trip. The Dean of Students Office is selling tickets for a concert featuring Joshua Radin and A Fine Frenzy. The concert will be held on Saturday night, November 3, at 7:30pm at the Orpheum Theatre in downtown Boston. The seats are located in the Orchestra section and we are selling them at a discounted price of $20 per ticket. Tickets are very limited so. if you are interested, we encourage you to purchase them as soon as possible. Tickets can be purchased directly from the Dean of Students Office during our normal business hours (Monday-Friday, 8:30am-5:30pm). We take cash, check, and credit card (Visa, AmEx, MasterCard). With any questions, please feel free to stop by our office, call us at 617-495-1880, or email us at dos at law.harvard.edu. The Dean of Students Office has a few hundred tickets to the Friday, September 7th game starting at 7:10pm at historic Fenway Park. Tickets are $30 (Right Field Grandstand, Section 3). They will be sold on a first-come, first-served basis. We accept cash, checks (made out to HLS with Red Sox Tickets indicated on the notes line), and credit cards (AmEx, Visa and MasterCard). If you want to sit with your classmates, you should come to the DOS Office together to purchase your tickets. Spouses and guests are welcome, and we will check student IDs to confirm each sale to student buyers first. Resale of tickets is strictly prohibited. We will begin ticket sales promptly at 12 noon on Tuesday, September 4th following Labor Day weekend in the DOS Office (WCC 3039). We will open up ticket sales to the broader HLS community later this week as available. A link to the Fenway Park seating chart is included below. Kathy Griffin, Seth Meyers, and Second City Tickets for Sale!! If you would like to see exactly what seats are available and/or purchase tickets, you may do so in the Dean of Students office (WCC 3039). You can pay with cash, check, or credit card. Limit is 2 tickets per student. Kaplan will review bar exam content including MBE, MPT, MEE and state exams, application deadlines and summer study schedule. Stop by for lunch and information. Speaker(s) Daniel Gilbert, Professor of Psychology at Harvard University, author of Stumbling on Happiness., and host of the PBS television series This Emotional Life.Most experts tell us what to decide but they don’t tell us how. So the moment we face a novel decision—should I move to Cleveland or Anchorage? Marry Jennifer or Joanne? Become an architect or a pastry chef?—we’re lost. Is it possible to do the right thing at all possible times? In fact, there is a simple method for making decisions that most people find easy to understand but impossible to follow. New research in psychology, neuroscience, and behavioral economics explains why.Hors d’oeuvres and beverages will be served. This event is open to the Harvard community only. ID cards will be required for entry. There will be an informational session on Thursday, February 16, 2012 at 12:00 noon in WCC Milstein West A. Catered lunches will be provided. Third-years and LLM students are particularly encouraged to attend, as the topics covered will include the logistics of applying for the bar, the structure and content of bar exams, as well as the key points to know in preparing for the bar. Discussion will touch upon the bar exams of various states, with emphasis on New York and Massachusetts. Dean Cosgrove will also speak to students about the character and fitness portion of the bar. 1Ls and 2Ls are also welcome. All students who attend will receive a discount voucher for a bar review course. Professor Howard Gardner Presents: In 2012, What is ‘Good Work’ in the Law? 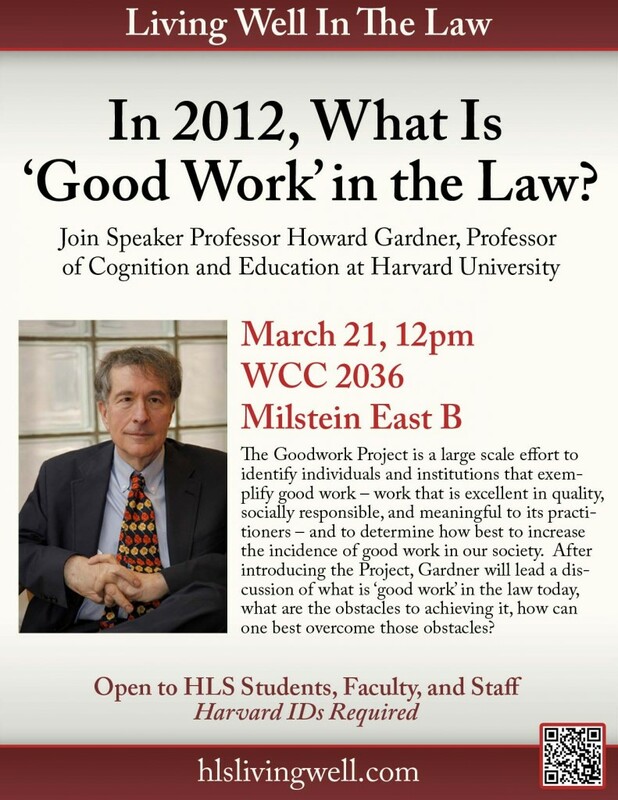 Professor Howard Gardner – In 2012, What is ‘Good Work’ in the Law? Daniel Gilbert, Professor of Psychology at Harvard University, author of Stumbling on Happiness., and host of the PBS television series This Emotional Life. All students should meet in the WCC lobby with luggage at 2:30pm for a prompt 3pm departure. Trip includes 2 days of lift tickets, a 30-min lesson and transportation! A sweatshirt and dinners will also be included. * The trip will return to Boston in time for the Superbowl for all you football lovers! description: Audition for the 2012 HLS Parody!!!!!!! Email parody2012 at gmail.com to sign up for an audition time! The Parody is a 50-year old law school tradition – a completely student written and run full length musical comedy parodying everything from law school to politics to pop culture. Drawing over 1600 audience members, the Parody is one of the largest events on campus each year! We need actors, singers, and dancers – sign up for an audition slot by emailing Parody2012 at gmail.com. We need everyone from theatre majors to students experiencing their first show. What if I don’t want to act/sing/dance? We also need band members, particularly guitar. Additionally, email us if you are interested in getting involved behind the scenes (tech crew, light board operator, crowd management, makeup etc). E-mail Parody2012 at gmail.com to schedule your audition time. Please include your preferred audition times and any absolute conflicts you have during the audition time.